There is nothing like a warm soup on a chilly winter afternoon. And, even though, some may be used to the canned options available at the supermarket, it is time to start making your own. This creamy mushroom soup is delicate, filling and easy to make. Its also an ideal starter for a special dinner or a holiday lunch. So, start cooking! 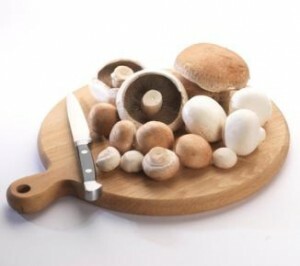 Wash mushrooms and slice them finely. In a large saucepan, over medium heat, heat the olive oil and add the spring onions, shallot and mushrooms. Sizzle until softened. Pour in the white wine and bring to the boil for 1-2 minutes, so that the alcohol evaporates. Carefully add the vegetable stock to the pan and let it cook for approximately 20 minutes. Remove from the heat and use a hand-blender to blitz the soup until smooth. NOTE: If you don’t have a hand-blender, put as much of the soup as possible into a common blender and blitz until smooth and tansfer it back into the saucepan. Your soup will be “semi-smooth “since not all can fit into a blender but it will be equally tasty. Careful, the content is very hot! Then, mix in the double cream, season with salt and pepper and let it shimmer for 1-2 minutes. Remove from the heat and let it cool for a few minutes. Serve soup into deep bowls, garnish with the chopped parsley and accompany with a slice of garlic bread. If you want to give a smoky taste to your soup, you can add thinly chopped pieces of crispy fried bacon on every bowl before serving the soup. The smoothness of the soup with the crispness of the bacon pair wonderfully. A touch of mascarpone cheese as a garnish, gives a fresh touch to the velvety texture of the soup. If your soup becomes too thick, you can thin it out by adding hot vegetable stock. It looks very delicious, I intend to make it really soon, because the recipe is really easy!